Traumatic dental injuries (TDIs) occur with great frequency in preschool, school age children and young adults comprising 5% of all injuries for which people seek treatment. Literature reports that 25% of all school children experience dental trauma and 33% of adults have experienced trauma to the permanent dentition with the majority of injuries occurring before age 19. TDIs present a challenge to clinicians worldwide. Consequently, proper diagnosis treatment planning and follow-up are critical to assure a favourable outcome. Traumatic dental injuries may jeopardize pulp survival in the affected teeth. Treatment of traumatized teeth depends on the type, location and severity of each injury. Luxation injuries and avulsions are the most frequent traumatic causes for pulp necrosis resulting in the need for endodontic treatment. Pulp necrosis, chronic and cystic apical periodontitis can be the fate if traumatized teeth are left untreated. In this webinar we will experience how to provide a long term restorative management for different dental injuries including luxation, avulsion and tooth fractures. 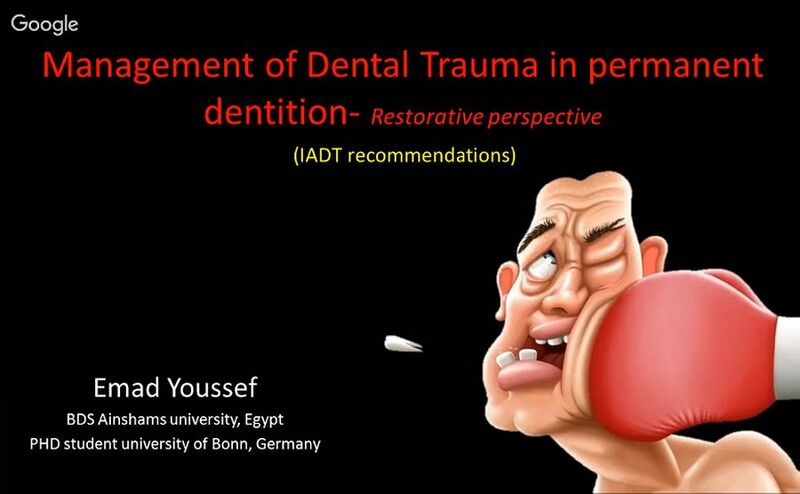 IADS WEBINAR/Management of Dental Trauma - Restorative perspective by Dr. Emad Youssef- PhD student at Bonn University, Germany.